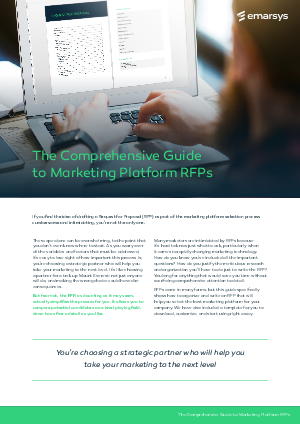 Not all marketing platforms offer the same services or features, which is why it’s so important that your RFP helps you compare them accurately. These tips should prepare you to collect the information needed to compare prospective vendors on your terms, not theirs. Additionally, our marketing RFP template was designed to help make the whole process easier. Customize it to meet your specific needs, and be sure you get all the information you need from every prospective vendor to make this important decision. Remember, you wouldn’t partner with just anyone to climb Mount Everest. Selecting the right partner for your marketing platform is an important, strategic, long-term decision, with large-scale consequences. Choose wisely.